Measure speed and distance without the need for GPS with the Edge Speed Sensor. 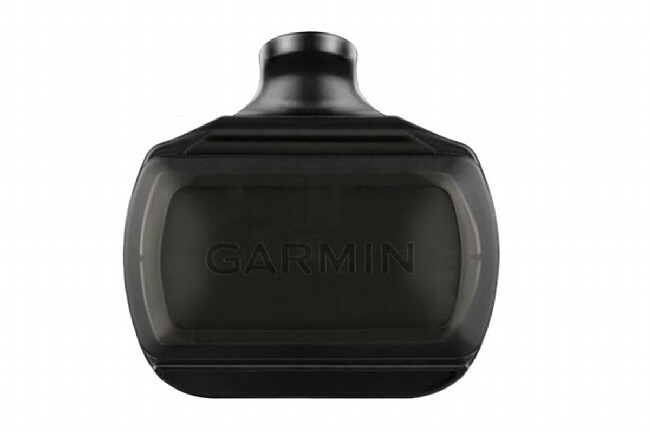 Easily attaching to the hub of either the front or rear wheel, this sensor from Garmin lets you record speed and distance data without relying on GPS. This is perfect for areas or times with poor GPS coverage, or for indoor use on a trainer. With simple installation, no wires, and no magnets to line up, setup couldn't be easier with the Edge Speed Sensor's self calibration with your Edge head unit. I installed this speed sensor on my road bike that I am using on an indoor trainer. I use it with both my Garmin 520 and my laptop. It was easy to setup and get attached to both devices. I have not used it outside yet since the weather has not been good for road bike riding. I've had no problems since putting this on my rear wheel. Read where some riders had intermittent issues being on rear wheel vs front, but I haven't noticed anything. Which ever wheel you have it on...it works! My bike is on the trainer in the basement where it cannot get any GPS info. But with this mounted on the rear wheel I get the speed and distance info. Now only if it would only register higher numbers! On the trainer it always seems like I should be going faster for all the work I do! Can't wait until it gets warmer outside. Speed sensor on my GSC-10 broke. It's easier to use this device than to buy a new GSC-10 (2, in my case). I use it on the trainer for speed/distance calculation. With cadence reporting from a power meter, I no longer needed the speedcadence sensor. Having the speed sensor is nice when the GPS has the occasional drop out, so this fit the bill. Added plus is that it virtually disappears on the bike. Literally seconds to install and pair with the head unit. So far, seems flawless. This gizmo replaces the speed sensor for you garmin that hangs on the rear stays. This one wraps around the front or rear hub. It partially eliminates the need for the older speed sensor, and eliminates the needs for batteries. Just one thing thought, unless you are riding indoors or areas where GPS satellite coverage is poor (maybe the North or South Poles) you really don't need it. Garmin sells this either separately or in a kit with a cadence sensor that also eliminates the needs for magnets. I have a Garmin Edge 520. This was easily paired with my unit and is a nice addition for riding indoors. It allows me to set an indoor profile and uploads ride data to Garmin connect. Put on my wheel for speed on trainer rides. Works well most of time but with sometimes settle down to one or two mph even when I don't. Works great - super convenient! I got the speed sensor only as I have cadence built into a Stages power meter. So much more convenient than magnet based system I have on my older bike. Also much easier to move from bike to bike if needed. On occasion I end up in places where satellite signals get lost. The Garmin Edge Speed Sensor provides continuous readings to help accurately record the distance covered. The new speed sensor wraps around your wheel's hub and uses an accelerometer to compute speed as opposed to the old magnet-based sensor. It eliminates the annoying tick-tick-tick sound that can occur when the spoke magnet hits the sensor arm when they go off position after a huge bump. Battery life is pretty good, too. The sensor will wrap flush around most hubs, but certain ones (e.g. curved hubs) will cause it to mount askew. This is only a problem with tight spaces, such as 130mm rear, curve-shaped hubs where the sensor won't mount securely causing erratic data reads. In these situations, it's easier to mount it to the front hub. Overall, I prefer these type of speed sensors. I just wish Garmin would support Bluetooth LE (BTLE) in future versions. Works as well as the older model, but no magnets on your spokes or big ugly sensor on your frame. Only downside is that you need to buy a separate sensor for cadence.